This eBook can only be purchased by people residing in Australia. This indispensable handbook focuses on 12 specific skills every software architect needs to succeed: skills involved in becoming a superior technologist and an outstanding technical champion. 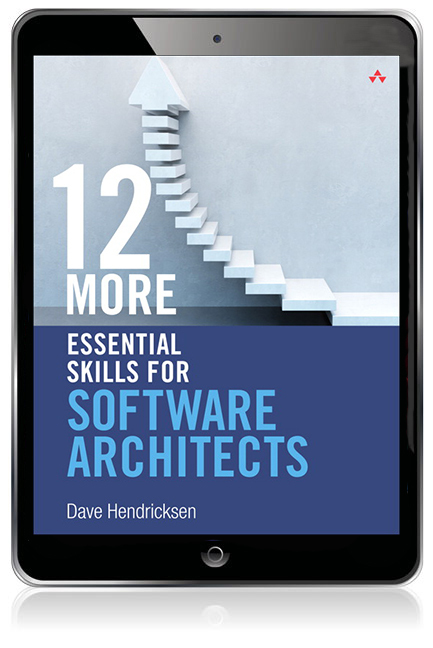 Ideal for both working and aspiring software architects, 12 More Essential Skills for Software Architects is the perfect complement and follow-up to Dave Hendricksen's previous best-seller, 12 Essential Skills for Software Architects. These books place real-world practice in the context of the development organisation and the business and help blend the optimal mix of both hard and soft skills. What Are the Key Aspects of a Partnership? What Is an Architect’s Role in Roadmapping? Where Can You Use Roadmaps? To get the most out of your eBook you need to download the Bookshelf software. This software is free to download and use. Click here to view the Bookshelf system requirements. Upon purchase, you will receive instructions via email, on how to redeem your code and download this eBook.